Fly the Australian Flag to express your pride in Australia as a united nation. Flagworld offers a range of Australian flag sizes and material choices, with the flag proudly Made here in Australia. 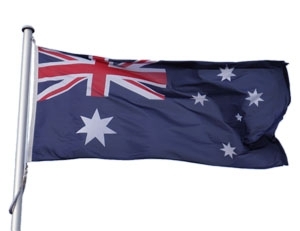 The Australian flag comes in either knitted polyester which is great for indoor and low wind areas, woven polyester that is a heavier fabric and better for high wind, or as a fully sewn flag that is also made from woven polyester, but the design is sewn on rather that printed for a premium look flag. Australian National Flag 1000mm x 2000m (Pull Up Banner) with silver base.